Sheffield City Region Enterprise Zone has created nearly 500 jobs since it opened in April 2012. Based on a series of key sites that focus growth within the advanced engineering and technology sectors, companies located in the zone benefit from simplified planning rules and tax breaks. One of the main benefits that the zones offer is a business rate discount worth up to £275,000 per eligible business over a five year period. Companies within the zone can also take advantage of enhanced capital allowances (instead of business rate discounts) for plant and machinery. When it was announced in 2011, it was forecast to create 12,600 jobs and attract around 250 new advanced manufacturing and technology-based businesses to the area by 2015. When complete, it could reach 20,000 jobs, 400 businesses and £20m a year in new business rates from over 6.4 million sq ft of floor space. A number of key employment sites in Rotherham are included in the zone such as areas of the Advanced Manufacturing Park (AMP) (cgi above), Templeborough and Dinnington. Nationally, Enterprise Zones created 12,530 jobs, attracted 434 new businesses and generated over £2 billion worth of private investment since opening for business. Communities Secretary Eric Pickles said: "Sheffield's Enterprise Zone is a success. Not only is it creating hundreds of jobs, but it's also playing a vital role in training the next generation of engineers to ensure the UK can compete on a global scale. 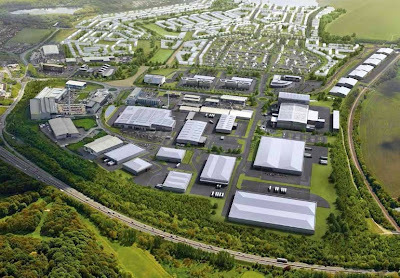 It's further proof that our enterprise zone programme is on track, driving forward local economies and providing benefits to the community." James Newman, chairman of the Sheffield City Region Local Enterprise Partnership, added: "Our LEP has focused on building the UK's number one Enterprise Zone for modern manufacturing and technology. We offer investors outstanding transport connectivity, a highly-skilled talent pool and the best UK Government tax incentives available. The strategy is clearly paying off with world leading technology companies recognising that Sheffield City Region is the best place for them to thrive in a highly competitive global marketplace. "Since its launch, 18 new companies have located on our Enterprise Zone with 480 jobs already created on site and around 400 set to be created in the coming months. Our Zone is also home to over 160 students at the University of Sheffield's AMRC Training Centre − providing the skills that manufacturing companies need to compete globally." X:Cel Superturn and Sarclad Limited were the first manufacturing companies to move into the enterprise zone on the AMP. Further development is taking place on the park with Nikken Kosakusho Europe, Maher and another firm expanding into the R-evolution development. Millions in government funding has been secured by owners Harworth Estates to further improve the infrastructure around the Waverley site. Development land in Dinnington was added to the EZ earlier this year. St Pauls Developments, is bringing forward a 17 hectare site, previously known as Phase 2 development land and located off Todwick Road. It has been given the name "31 East" given its location close to junction 31 of the M1. At Templeborough, Jaguar Estates is planning the second phase of development at Magna 34 which will be both smaller business units from 200 sq ft up to 25, 000 sq ft. The intention is to build out around ten smaller units for industrial and trade occupiers on a for sale or let basis and this should start by March 2015. All business rates growth within the zone for a period of at least 25 years will be shared and retained by the Sheffield city region, to support the Local Enterprise Partnership's economic priorities and ensure that Enterprise Zone growth is reinvested locally. However, the complexity of the business rates system is making it difficult to implement a mechanism for this to happen.